So I finally got my hands on the majority of our spray cleaners and protectants. I plan on running some tests with pictures and video of them doing their specific job. More on the videos tomorrow. 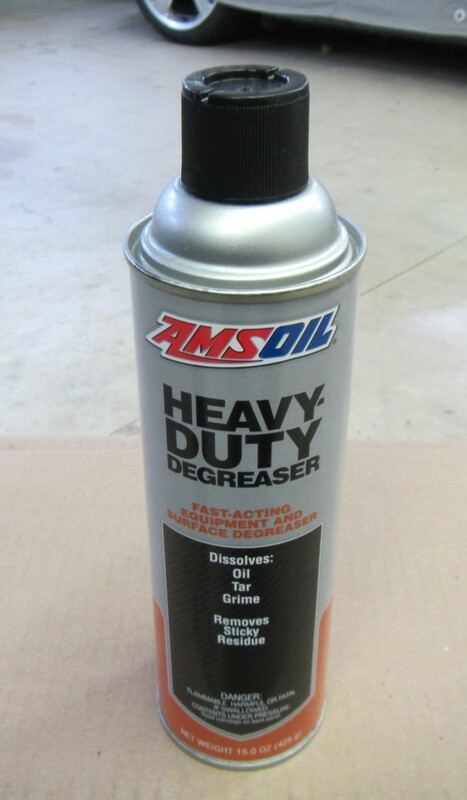 The first spray can I grabbed was the Amsoil Heavy- Duty Degreaser. I wanted to see how quickly and easily this would work so I grabbed a shop rag and the can and found a spot to clean. 1. Its going to do a rather good job at removing whatever is stuck on the surface I’m trying to clean and some elbow grease will be needed. 2. Its going to smack me right in the nose with a really strong smell of chemicals. So back to my spot that needed cleaning. I sprayed a liberal amount of degreaser and let it set for under a minute. The can says 1-2 minutes but I wanted to know how quickly it works. As I was spraying, I noticed immediately that I was not hit by a plume of noxious gases, instead all I could smell was orange citrus awesomeness. Finally a cleaner that didn’t smell like it was trying to kill you while doing its job. After around 30 seconds had past, I took the shop cloth to the oil stain that was on the floor, it simply wiped off with two passes. At this point I was about shocked until I remembered that I have never used a product from Amsoil that hasn’t exceeded my expectations. I know, I know, “Well of course he would say that” you must be saying. If I find something I don’t like about a product I will most defiantly be adding it to my reviews. Heck this was a short and quick test maybe tomorrows longer test will give me a different outlook. All I can say about the Amsoil product lines is that not once have I been disappointed, this is the reason I am an Independent Dealer.